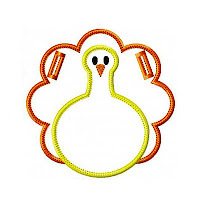 A fun decoration you can make for Thanksgiving! You can also add letters from your embroidery machine to personalize! The ribbon "legs" are an optional step. This is a quick and easy two-sided banner all done in the hoop with step-by-step instructions to guide you. You are hooping stabilizer only, appliquéing your fabric, adding ribbon "legs" and font/designs over the top if you wish, applying backing fabric behind your hoop, finishing the edges and ribbon holes and cutting away the stabilizer. This banner blank slides onto ribbon 5/8" wide. - TURKEY BANNER ITH in the format of your choice.